The winner for the best overdate is this 1883/2 for its very dramatic 2 visible to the west and very slightly lower than the 3. Highly sought after as a hole for it appears in coin albums. This variety is very well known and catalogued by Breen as BR2524. 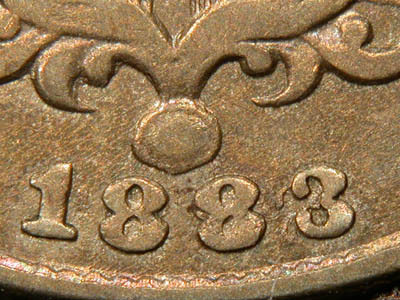 This is the same coin, just a little tighter photograph of the overdate. Runner up is another 1883/2 variety (there are five 1883/2 varieties). While not quite as dramatic as the winner, this 1883/2 is still a very nice variety. 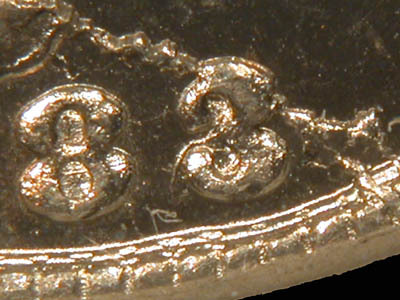 The underlying 2 is slightly to the left of the 3. 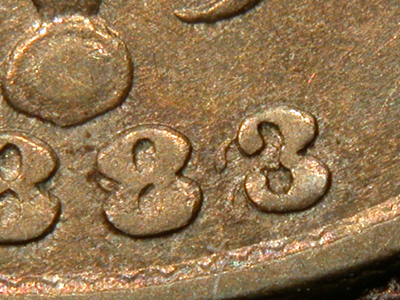 The die crack arching over the date is diagnostic for this variety. 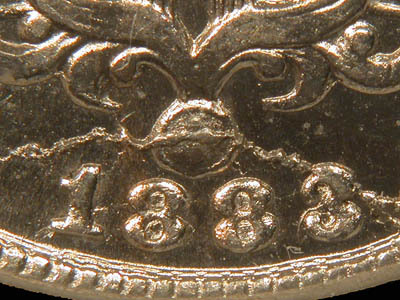 There is only one overdate variety in the shield nickel series that is not an 1883/2 (1879/8). It is not very dramatic. This is the same coin, just a little tighter photograph of the overdate. The foot of the underlying 2 is the easiest to see. This page copyright (C) 2004 by Howard Spindel. All rights reserved.